If I have two objects, Person A and Person B, and I want to know if Person B is facing the same direction as Person A; once I have the vectors, how do I use the normalized vector to show direction? I've read the math on vectors, but I'm still learning, and I am not understanding how the unit vector shows direction. I know it does, but I don't know why. One person said they imagine it on the unit circle. I understand how that can show a direction, but what I don't understand is how the normalized vector shows me a direction. I have seen "What is a direction vector and why should it be normalized? ", but I am still missing it. To break it down, first we get the length (aka magnitude) of the vector by Pythagorean theorem which you probably have learned at school. After we have the length of the vector, we divide the original vector by it's own length to make it a unit vector. In other words, we reduce the length of BtoA into just one, which makes it an unit vector. Now at this point, the unit vector we got from normalizing the BtoA vector is now just pointing at the direction of A from the point of B. Basically we have only reduced the length of the BtoA vector to 1, which is why it is just pointing at the direction of A from the viewpoint of B. And then as you asked, how to figure out if person B is facing at the same direction of person A, you need to know the orientation of person B and A. You don't get that just by calculating the direction to A from B. The dot product has a property of telling if two unit vectors are in parallel, and if not how much they differ. 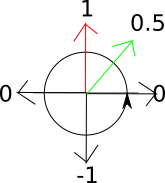 If the dot product is 1, the two unit vectors are pointing exactly at the same direction. If it is 0, the unit vectors are perpendicular to each other. So any values above 0 means that the unit vectors are going in roughly the same direction. Of course using 0 as a threshold for determining if B is facing A is a bit wrong here, as you are talking about a person. If you define that a person is facing the other when the orientation towards the other is in 90 degree range, you can just check if the facing value is more than 0.5, which probably gives better results. You can also define that a person is facing another only when they are exactly looking at the other, which then requires you to use a value very close to 1. Now you can tell if B is facing A. It requires a bit more than just the normalized direction from B to A. But this still does not answer your question. And there you go, that is how you determine if A and B are facing the same direction. Not the answer you're looking for? Browse other questions tagged vector linear-algebra direction or ask your own question. What is a direction vector and why should it be normalized? How to smoothly rotate a vector in a direction? How do I use the dot product to get an angle between two vectors? How to rotate a line in 3d space? How do I get a vector from an angle?